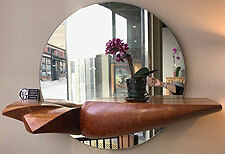 This cherry mantel mirror (32"h x 40"w x 9"d) was crafted by Eric Sprenger of Wilmington, a member of the Guild of Vermont Furniture Makers. When longtime international decor wholesaler Cultural Intrigue lost its 35 Frost St. home to foreclosure, Pierre and Ellen Capy of Mocha Joe's Roasting Co. stepped in to secure the property at a good price. In addition to expanding Mocha Joe's office and roastery space, they wanted to eliminate warehousing expense in New York City. The building now also houses Recycle Away (which sells recycling containers) and HatchSpace, a cooperative workspace for craftspeople. The info below is adapted from www.HatchSpace.org. A mahogany mirror and walnut console table by Guild of Vermont Furniture Makers member Eric Sprenger are displayed with a walnut coffee table and fir-and-mahogany door by HatchSpace co-founder Tom Bodett—stop by for a cozy gallery experience at the Latchis this month. 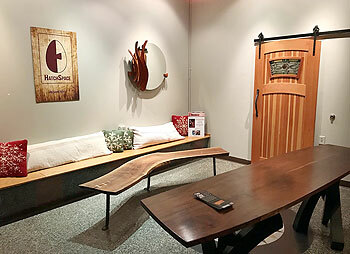 HatchSpace is a membership workspace where craftspeople exercise, share, and move toward mastery of their craft. 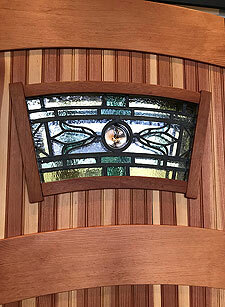 Beginning with woodworkers, plans include gradually accommodating other disciplines such as ceramics, glass, metal, and upholstery. 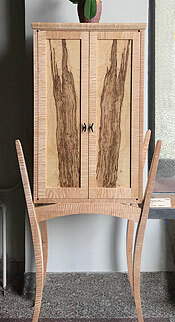 The best of membership work will be exhibited and offered for sale in a public HatchSpace Gallery, a cooperative retail business engaged in the display, marketing, selling, and commissioning of the very best work of master wooden fine art and furniture makers in and around Vermont. (Pop-up gallery exhibits in other downtown locations, such as the one at Latchis Gallery this month, will also bring attention to the HatchSpace project.) The master woodworkers and other invited artists and craftspeople participating in these exhibits will be made available to the community through storytelling, lectures, and HatchSpace workshops. Benefits of membership include on-site training and support—including Master Classes in a range of techniques and disciplines; use of state-of-the-art machines not usually available to the beginner or home hobbyist, and access to a gathering place for area craftspeople to exchange knowledge, ideas, and fellowship. Mentoring of members at all levels of expertise will be ongoing through the shared community workspace. HatchSpace will also offer access to locally sourced materials and direction to a wide range of regional resources. Due to the generosity of Dave Snyder (Guilford Sound) and Sara Coffey (Vermont Performance Lab) of Guilford, VT; Stan Richards of Dallas, TX; Jim Harvey of Seattle, WA; Bo Foard of Foard Panel; Temple Petersen, Larry Cassidy, Bruce Berg, and all of its Founding Members, HatchSpace has been able to secure space for its first year while gathering and installing equipment. HatchSpace hopes to open enrollment for general membership the second week of January and open its doors by the end of January. Collaborative programs with the Brattleboro Museum & Art Center and the Boys & Girls Club, among other area organizations, will also be explored. HatchSpace operates as a mission of The Hatch, Inc., a non-profit corporation managing both the workspace and the gallery. A board of directors, along with executive director Greg Goodman, are responsible for the management, marketing, and fiscal health of the endeavor with assistance from the membership. Check www.HatchSpace.org for further information.